Its curved design lets you compensate for a wide variety of crown molding spring angles, and its extension arms lets you work with crown up to 51/2" (140mm) wide. 10" (254mm) saws will work with crown up to 31/2" (89mm) wide, depending on manufacturer. 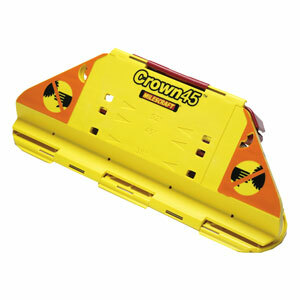 12" (305mm) saws will work with crown up to 51/2" (140mm) wide, depending on manufacturer. Unlike other crown molding jigs on the market, the Crown King requires no assembly and is designed for the ultimate ease of use. Right out of the box, it enables professional and DIY woodworkers to produce interior and exterior corner joints with the three most common crown molding spring angles (38, 45 and 52 degrees). The Crown King comprises two pieces: the jig itself and a versatile and reconfigurable insert/adapter. Without the insert, the jig is positioned for cutting 45-degree spring angle moldings. 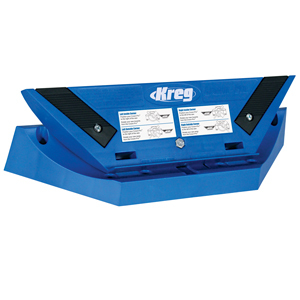 The insert quickly reconfigures the jig to accommodate 38- or 52-degree spring angles. No more "Upside Down and Backwards" thinking! Save time and money by cutting the stock correctly, the first time. The Milescraft® Crown45™ crown molding jig for miter saws will change the way crown molding projects are done, because there is no more "Upside Down and Backwards" thinking when cutting. The innovative “right-side up” cutting orientation, novice and pro alike can save time and money by cutting the stock correctly, the first time. With the Crown45™, crown molding will be cut the way you see and install it on the wall. Adjustable angle setting set to work with common molding spring angles (38, 45, and 52). Angle finders included easily determine the spring angle of your molding. Wide indented cutting surface. Support all crown moldings between 2 and 5.5. Accommodates special dentil style detailed moldings. Collapsible design for compact storage. Cut finished moulding with no break out on the finished surface. 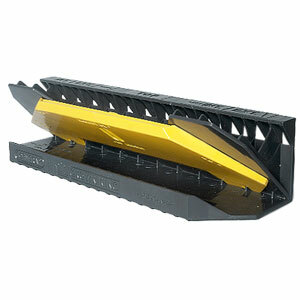 Saw blade enters the material from the front due to its unique orientation.